Cormant-CS has the ability to display colored football field views, where spaces and locations of each piece of equipment, your data center, and racks are shown on via customisable colour-coded overlays. The customisable colour-coded overlays will allow you to interpret values at a glance. As an example, if the Rack is 80% occupied/used, the rack will coloured red. If the rack is 50% used, (meaning that it has less physical contents installed), the rack will be blue. In keeping with the fully customisable database theme, Cormant-CS allows you to define the colours and percentage values to suit your organisation. The football field views and floor plans are available on both the desktop, web and handheld clients. Cormant-CS will automatically update the football field views as informaiton is populated in to the database. This could be a staff member from the server team drag and dropping a new HP DL360 G7 in to a rack, or a Cormant-CS script reading an IP power rails ‘Actual Power’ value every 5 minutes. Many organisations utilise the Web-Interface for thier NOC (Network Operations Centre) and display the DC layout on a large screen, with real-time data of the current utilisation (power, capacity etc). Floor-plans can be imported from various file formats including Visio ®, AutoCad ®, png, bmp, jpg etc. Cormant-CS also has the ability to export your floor plan. Once in Cormant-CS, the can be captured, pasted in to a document, and send to engineers so they can immediately locate or troubleshoot network problems. This functionality is useful to locate spaces and equipment, particularly for engineers who are not familiar with the entire layout of a large office or warehouse, to manage spaces e.g., floors, work area, data centre, racks, and equipment. Floor-plans allow you to audit equipment in physical spaces, to view and monitor specific rack attributes such as temperature, power, rack units, etc., and to provide more accurate planning capabilities for Moves, Adds, and Changes where precise locations of any piece of equipment, or outlets can be displayed. Plans can be imported from various image files including Visio ®, AutoCad ®, png, bmp, jpg etc. Cormant-CS also has the ability to export your floor plan. Floor-plans can be captured, pasted in to a document, and send to engineers so they can immediately locate or troubleshoot network problems. 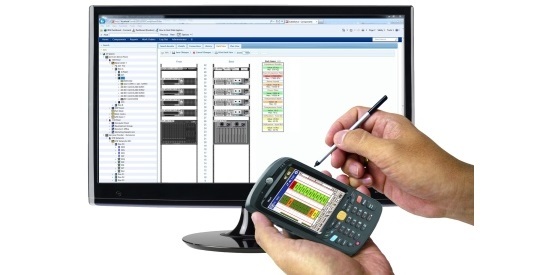 This functionality is useful to locate spaces and equipment, particularly for engineers who are not familiar with the entire layout of a large office or warehouse, to manage spaces e.g., floors, work area, data centre, racks, and equipment, to audit equipment in physical spaces, to view and monitor specific rack attributes such as temperature, power, rack units, etc., and to provide more accurate planning capabilities for Moves, Adds, and Changes where precise locations of outlets can be displayed. Customers are able to configure the football field views to suit thier individual organisations. As an example, a customer may wish to have racks that are reaching 70% physical capacity to dispaly in Red, whilst another organisation may wish for the capacity value to be 90% or above. Cormant-CS allows the customers via a simple user interface the ability to tailor these overlays, without the need for additional help from Avantex or Cormant. The overlays can be configured to display values from any numerical attribute. Items such as RU Used, RU Free, Weight, Power Plate, Power Actual etc can all be configured within Cormant-CS. 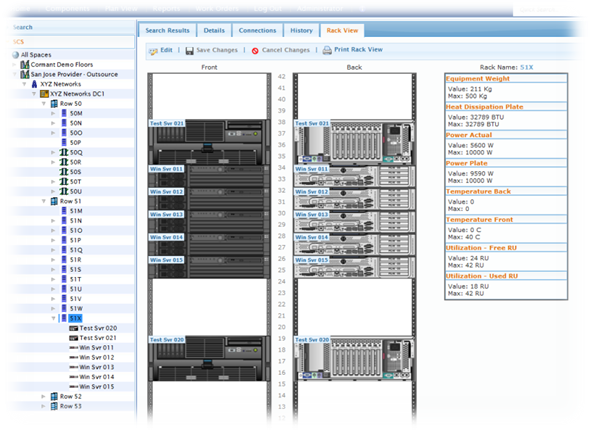 Full Racks Layouts and visible and editable on the mobile scanners greatly aiding the time to service a customers needs. Plans are available on the Desktop, Web and Hand Held Interfaces. Adjust a devices location, or even add a new device directly from the Hand Held Scanners. Accurate floor plans on a mobile device. Showing capacity, heat and many other values.